I do not know what is the meaning of my sadness. A tale from the old times comes to me. The air is cool and it is becoming evening. The Rhine flows peacefully. The top of the mountain sparkles in the evening sun. The loveliest maiden sits up there, marvellous. Her golden jewelry gleams. She combs her golden hair. She combs it with a golden comb and sings a song at the same time. This song has a strange, imposing melody. The song seizes the boatman below with wild sorrow. He does not see the reefs, for he can only look upward. I believe that at last the waves swallow the boatman and the boat. The Lorelei has done this with her singing. The April 1996 performances by the Lithuanian Opera Company of Chicago of Jūratė ir Kastytis by Banaitis has inspired the present reconsideration of this major Lithuanian opera. 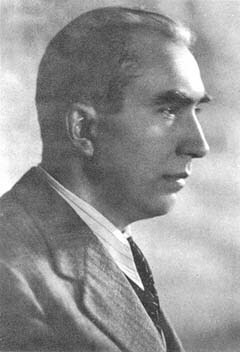 Completed in 1955, Jūratė ir Kastytis was composed in the last years of the composer's life, when he was almost destitute and suffering from Parkinson's disease. Based on the ancient Lithuanian legend of the love of a sea sprite for a mortal on the shores of the Baltic, this opera is related to musical settings of the Lorelei and Undine myths — myths which have much in common with that used as the basis for this opera. It is within this context that I will discuss what has become one of the most influential Lithuanian operas of the century. The conductor for the performance was Alexander Kučiūnas. The orchestration was done by James T. Kilcran. This legend is held to have considerable nationalistic importance and can be viewed as explanatory of the origins of Lithuania as a self-sufficient country. Juozas Gruodis used the legend as the basis of a ballet in 1933, while the playwright Aleksandras Fromas-Gužutis conceived his 5-act drama Jūratė, the Goddess of the Sea (1955) from the legend as well. In addition, Lithuanian sculptors and painters have used this myth as the basis of their work. One of the principal examples is the sculpture of "Jūratė ir Kastytis" that stands in the main street of the resort city of Palanga. This legend is somewhat related to the Undine and Lorelei myths popular in Germany because of the common emphasis on the destructive relationship between a mortal and spirit. In Lithuanian folklore sea nymphs are immortal goddesses who have magical powers, but they lose the gift of immortality when they fall in love with a human. It is their immortality and special powers which set them apart from their human counterparts and make any union impossible. Lorelei is an echoing rock in the Rhine near Sankt Goarshauen, West Germany. According to the Encyclopedia Britanica, Lorelei was a maiden who threw herself into the Rhine in despair.3 She was transformed into a siren who lured fishermen to destruction. The essentials of the story are present in Clemens Brentano's novel, Godwi (1800-02). As is clear from the Heine poem presented at the beginning of the article, Lorelei is, like the Homeric Siren, a spirit that calls from the land. It is clear from the above that parallels exist between these versions of what may be considered a universal myth. They receive attention during the Romantic period, or that time during which folk mythology is used as sources for literature but also for the creation of national identity. A common theme is that of a spirit, either from the sea or near the sea, who brings destruction to a mortal man. The Lithuanian variant, however, highlights the sea nymph's divinity and the importance of amber as a national stone — a stone commonly found on the shores of the Baltic. It is possible that the 19th century Lithuanian authors cited above were aware of the work of their Slavic and German counterparts. These now forgotten German operas have important Romantic traits and prefigure symbolic and musical elements of Wagner's Ring. They also create a tradition of setting this powerful myth that would continue into the present century. Elements of Undine legend are included in the importance given water sprites at the beginning of the Das Rheingold, which, as we have seen, is musically influenced by some of the works cited above. Ravel's Undine, the opening movement of his virtuosic cycle for piano, Gaspard de la Nuit (1908), is probably the most important treatment of this legend. Ravel's rich harmonic vocabulary and intricate piano figurations fully capture the essence of this mysterious sea figure. It is unclear whether Banaitis was aware of any of the Lorelei, Undine or Russalka operatic settings mentioned above. He may have heard about the Hoffmann setting during his studies at Leipzig, given its historical importance. He must have known Mendelssohn's overture, which is part of the standard repertory, and probably was aware of Ravel's piano piece. But another opera clearly exercised a strong influence, Debussy's Pelleas et Melisande (1902), based on the play by Maeterlinck. The dream-like symbolism of the play, the mysterious atmosphere of the opera, and its Impressionistic musical language influenced all opera composers of this century. More specifically, the declamatory voice style and fragmentary motives of Pelleas et Melisande are similar to those features in Jūratė. In order to understand the musical analysis of this opera, the following synopsis (included in the 1996 program book for the opera) is presented here. Act I, Scene I. In Lithuania, on the shores of the Baltic Sea, stands an ancient fishermen's village. Here men through the centuries inherited the skill for fishing as their very lives depended on it. It is late afternoon. The fishermen, preparing to sail, are singing lustily: "O sea of beauty why do you roar? Why do you sigh? Are you expecting guests? They sing on, their silver nets spread wide: they will snare a mermaid, a water sprite of the green sea. For their sisters or their loved ones they will bring back pearls of amber and golden fish. Maidens and wives arrive to see them off, to wish them good fortune and a safe return. The fishermen pray to the God Perkūnas, asking his blessing on their trip and the forestalling of wicked wind. They bid farewell to their dear ones and leave. Kastytis arrives late. He looks wistfully out to sea and sings a song of yearning. From the sea, the fishermen answer his song, awakening Kastytis from his reverie. In the distance, Jūratė rises from the sea intently listening to his song and comes toward Kastytis. Bewitched by her beauty, Kastytis is speechless. Jūratė sings "Kastytis, forget your earthly dreams, a beautiful new world awaits you." Recovering from his awe, he asks Jūratė: "Who are you? Where do you come from?" Jūratė replies: "The winds bend at my command, and at my word turbulent becomes the sea. I rule the green sea — and I love you, Kastytis." Kastytis tries to resist her charms. He loves Rūtelė. However, Jūratė continues her wiles. Mermaids (Undines) appear from the sea, singing to the rhythm of the waves: "When the moon rises, making a golden path in the skies, the sea will blossom with pearls." Slowly coming forward they continue, "We know no pain, nor death, nor suffering; we are young eternally!" The sorceresses sink into the sea. Kastytis, as if awakened from a haunting dream, repeats the words of the mermaids and Jūratė. Dazed by these wordless words, and such beauty, he is exhilarated as by fiery wine. He is bewitched. Jūratė persists relentlessly: "Kastyti, when your boat kisses the waves, my sea maidens will meet and gently rock it, and strewing wreaths of roses in his pathway, they will guide you to where I will be lovingly awaiting you. My amber chambers will gleam with the brilliance of lightning. Kastytis is bewildered by Jūratė's expression of love. Is this real, or is it a dream? It seems the whole world is passionately aflame. Enraptured with the singing and beauty of Jūratė and mermaids Kastytis hurries towards his boat. With a soaring song he sails away. The scene ends with Rūtelė rushing in and sorrowfully watches Kastytis sail away. Scene II. It's morning. Maidens mending fishing nets are singing: "The sea beckons to our loved ones, while we mend the nets." They do not notice the approach of Kastytis' mother who is searching for her son who did not return with the other fishermen. She muses: "The sea is so clear and quiet, the waves ripple so softly. Why hasn't Kastytis returned... maybe the Gods are angered?" Mother notices Rūtelė who watches the sea and in deep sorrow waits for Kastytis. Both women have a short conversation. Mother tries to console the young Rūtelė, but to no avail. She leaves while Rūtelė sings her plaintive aria. Finally Rūtelė cries out: "Kastyti, Kastyti! Where are you now?" and suddenly she sees a vision: it is Kastytis sailing at sea. Here Kastytis sings a most impressive aria, a Barcarole, titled, "Laivyne" (A Boatman's Song) from the pen of a foremost Lithuanian poet, Balys Sruoga, which the composer K.V. Banaitis inserted into this opera. As a vision disappears the voices of Jūratė and the mermaids are heard in the distance. Act II. Scene: Jūratė's amber palace, at the bottom of the sea. After a short musical introduction the curtain rises on a scene of mermaids dancing and joyously singing of the wonders of life in the sea. As Jūratė and Kastytis descend into the sea, they sing a duet, expressing their rapture for life and love. The mermaids lead them to the throne, strewing their path with roses, then break into wild, happy dancing, singing, "This is Jūratė's wedding festival." From the distance comes a clap of thunder. It rolls in closer and louder. The dancing subsides. Thunder increases. Jūratė commands the winds to raise the soaring waves to their highest, to greet Perkūnas, the God of Thunder, with the greatest of joy. The thunder becomes ominous. The Sea Winds warn Jūratė, Perkūnas is threatening a horrible revenge because she, a Sea Goddess, dared to love a mortal. Only a God should have been her choice. She can avert his wrath only if she renounces her love for Kastytis, and he returns to earth! Jūratė rises from her throne, comes forward and proclaims: "Winds! My brothers! I do not fear the threats of the Gods! What can they do to me when my heart is filled with the fire of love? I rule the sea! Winds, my fleet ones! Tell the Gods: Jūratė loves a son of the earth." Kastytis to Jūratė: "If we are to die, we shall perish together." The Gods send down their wrath. Winds die down but thunder roars. The amber palace darkens, lightening strikes. Kastytis and Jūratė stand ready to meet death. The mermaids, caught up in the tempest, dance wildly. The Sea Winds once more warn Jūratė that death is near. But Jūratė has no fear of dying with her beloved. With one last, violent clap of thunder, lightening shatters the amber palace. Darkness. The storm subsides. The ravages of the storm leave Kastytis deeply desolate and barely alive, chained to a rock on the shore. In retrospect he remembers Jūratė, his mother, his friendly fishermen, his home where the sun was always bright and where the wind softly murmured through the fir trees. He will never see them again. From far away, like the echo of a dream, he hears the song of the fishermen. Jūratė enters to answer Kastytis with an invitation to join her in the sea. The music for her aria grows out of the previous musical materials. As can be seen in the example just cited, parallel thirds and a rich modal harmonic vocabulary are employed throughout this section. An interlude for the Undines is then heard. The use of the word "Undinės" at this point of the score clearly relates it to the Undine works mentioned previously. As can be seen in the musical examples presented thus far, the musical style is quite unified. By this point in the score, it becomes clear that musical materials are derived from each other without repeated themes in the traditional sense. A dance for the Undinės follows which again uses open fifths, thus relating it to the previous dance episode. This is followed by a response by Jūratė and Kastytis using a declamatory style and emphasis on the interval of the fourth. This interval is also found at their entrance in the first act and is used to highlight important statements. The tonal center of D prevails at this point, though a shifting between major and minor occurs as the emotional tension heightens. This distance of tonality symbolizes his loss of Jūratė and his dream of a life with her in the sea — symbolized, as indicated above, by B major. Jūratė ir Kastytis has a high degree of organic unity created through the motives built on perfect fourths or tritones and the key schemes mentioned previously. In particular, the key of B dovetails the two final acts. The perfect fourth is used for straight-forward narrative, while the tritone implies either longing or despair. Two styles are emphasized: a modal, folk-like simplicity, and the harmonic procedures of the French Impressionists. The latter style, appearing in sections of doubt and conflict, highlights tonal ambiguity through the tritone and chords built on fourths. The choral sections anchor the works structure as well as comment on the emotions of the protagonists. There are major choral and dance episodes throughout, occupying as much of the opera as the music for the protagonists. This emphasis on the chorus is reminiscent of Mussorgsky's Boris Godounov (1868-69). At the end of the opera, for example, Kastytis is reminded of his loss through hearing the chorus of fishermen. Most of the solo writing is handled in a declamatory manner. The most important exceptions to this are the Barcarole and the duet at the end of the first act, where a more cantabile style is employed. In general, the opera moves at a slow dramatic pace. Although this can be considered a fault, it should be noted that this is quite typical of French symbolist drama — a tradition that I believe Banaitis was working in. In summation, Jūratė ir Kastytis not only begins serious contemporary opera in Lithuania, but it is also a minor masterpiece within the operatic repertory as a whole. Its telling of the common European myth of the bewitchment of a mortal by a sea nymph in a highly unified and structurally well controlled plan gives it this place of honor. 1972 Lithuanian Opera production of Jūratė ir Kastytis. 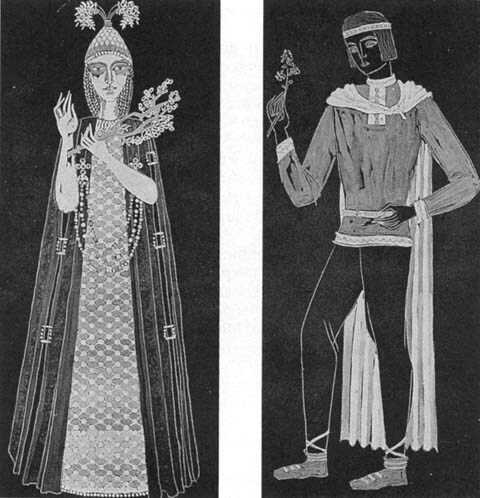 Costume design for the third act by Adolfas Valeška. 1 I wish to thank Dr. Dalia Kučėnas for help with the mythological background of this opera as well as providing the initial materials necessary for research. 2 Homer, Odyssey, Book 12, 11. 240ff. 3 The New Encyclopedia Britannica, Micropaedia, v. 7, 479. 5 On the other hand, in many traditions, the sea is viewed as a source of life. The most famous example of a Neo-Platonic depiction of this concept is Sandro Botticelli's The Birth of Venus from the Sea (c. 1480). The Lithuanian anthropologist Maria Gimbutas has written an important book in which she discusses ancient sea goddesses as sources of fertility and creativity: The Language of the Goddess (foreword by Joseph Campbell) (San Francisco: Harper & Roe, 1989). Jūratė should be thought of as belonging to this tradition. 6 Quoted in Neil Butterworth, Dvorak, his life and works (Kent: Midas Books, 1980), 121. 7 Donald J. Grout, A Short History of Opera, rev. ed. (New York: Columbia University Press, 1965), 381. 9 Karl-Heinz Kohler, "Felix Mendelssohn," The New Grove Dictionary of Music and Musicians (1980), v. 12, 149.